With just five races of the 2018 Formula One calendar to go, Lewis Hamilton pretty much has one hand on the title already. After his victory in the Japanese Grand Prix last week, the star Mercedes driver really doesn’t show any signs of faltering as he closes in on his fifth F1 World Championship title. Ahead of this weekend’s race at the Circuit of the Americas, TheSportWriter.com will tell you everything you need to know. So, read on as we give you our full 2018 United States Grand Prix preview. 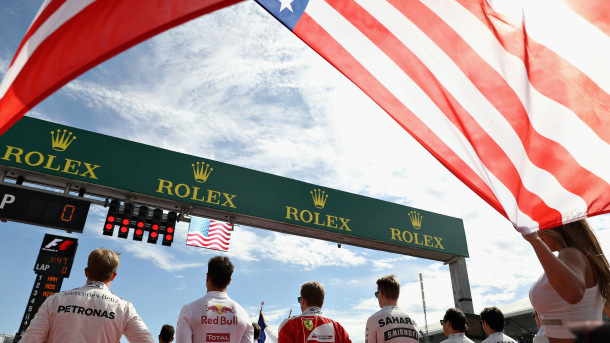 What Time Does The 2018 United States Grand Prix Start? The main event of the 2018 United States Grand Prix will commence at 19:00 BST, or 13:10 local time. So, if you were hoping to have a Sunday lie in and indulge yourself in a good old Sunday roast, you can do exactly that. For those who can’t wait until then, practice 1 begins tomorrow, 19th October at 17:00, followed by practice 2 at 20:00. Practice 3 then commences at 19:00 on Saturday 20th October, with qualifying taking place at 22:00. Taking place at the Circuit of the Americas in Austin, Texas, the United States Grand Prix is one of the most highly anticipated races of the Formula 1 calendar. The current United States Grand Prix circuit was designed by renowned track architect Hermann Tilke and opened in 2012. The circuit measures up to 5.513 km (3.426 mi) in total, which equates to a total race distance of 308.405 km (191.634 mi) over the course of 56 laps. 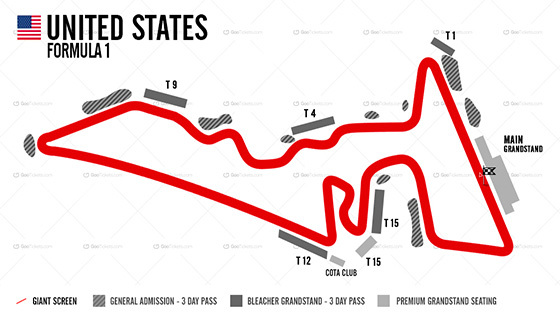 Previously, the United States Grand Prix has been held at various different locations throughout the U.S. This included the Indianapolis Motor Speedway which was used between 2000 and 2007 respectively. The event was then removed from the racing calendar altogether between 2008 and 2011. It eventually made a return in 2012 as the Circuit of the Americas opened. Other previous locations include Phoenix, Watkins Glen, and Riverside. In terms of the most successful racers on this particular circuit, it’s Lewis Hamilton who comes out on top with six victories. The legendary Michael Schumacher is the second most successful racer in the United States Grand Prix – earning himself five wins throughout his racing career. Lewis Hamilton, Sebastian Vettel, and Kimi Räikkönen on the podium at the 2017 United States Grand Prix. Lewis Hamilton emerged the victor in the 2017 United States Grand Prix. In the process, he was able to take full advantage of his start in pole position. The Mercedes driver finished the race with a time of 1:33:50.991. He shared the podium with his rivals Sebastian Vettel and Kimi Räikkönen. The Ferrari racers finished with times of +10.143 and +15.779 respectively. 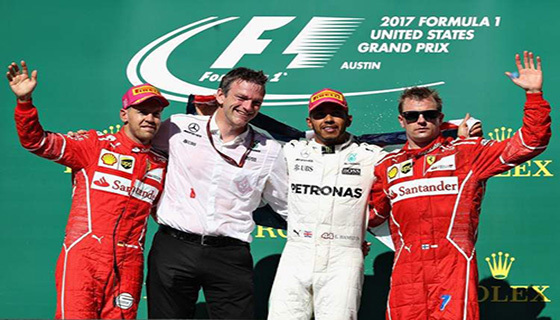 Who Will Win The 2018 United States Grand Prix? It is safe to say that Lewis Hamilton will set his sights on victory this weekend. After all, a win in this particular race will mean that he will finally get his hands on a fifth World Championship title. So, it certainly wouldn’t be surprising to see Hamilton claim victory and earn the all-important top spot on the podium. This is even more plausible considering the fact he has won every United States Grand Prix since 2012, with the exception of 2013 when then Red Bull-Renault racer Sebastian Vettel was able to earn the victory. In spite of this, it would be foolish to rule out Vettel for the win. But, then again, Hamilton has been a dominant force in this particular event. So, it might be easier said than done for Vettel to claim bragging rights! We here at TheSportWriter.com genuinely can’t wait for the action on the circuit to commence in Austin this weekend. We’re pretty sure all you motorsport fans can’t either! So, don’t forget to tune in and watch the main event this Sunday, 21st October at 19:10! Alternatively, you can let us know your thoughts in the comments section below or on Facebook, Twitter, or Instagram. *All times are in UK time.